Robotic Processing Automation known as RPA is an emerging technology, that automates a process in computer using Software Robots. Robot is a term that refers to a software or application that replicates the action of user and communicate with the system user interface. Process is said to be steps or sequence to do certain things. Automation is doing certain things automatically, without manual intervention. RPA is a process of creating software robots, that could do certain process automatically, without human intervention. UiPath is a Robotic Process Automation tool which is Windows based automations tools as it is developed using .net framework. UiPath comes with a Community Edition, which is free for lifetime and has most of the functionality of the Studio version but it will not include robots. You can even create your own custom activity and embed that in UiPath workflow using Dotnet programming. UiPATH is built using .NET framework. Hence, we can use functions of C# in it. Activities are nothing but modules and actions. 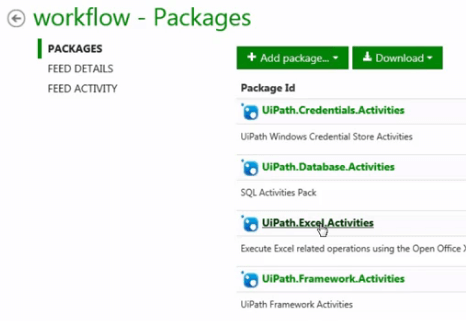 UiPATH has 300+ inbuilt activities, We can also import packages like Excel, Mail, PDF in addition to the built-in packages. 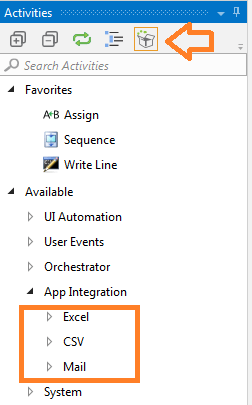 These activities are available in activities pane. 2. Developer Experience - UiPath typically requires some background in .Net development. Where a developer for BluePrism just needs to conceptually understand the basics of logic structures and .Net development is a bonus for creating custom code stages. 3. BluePrism has better control room functionality. 4. UiPath’s architecture is much more modern. BluePrism is catching up quickly if not already caught up. Both now fully support deployments in the cloud and offer reference architectures supporting the design. 5. BluePrism does have the capability to expose developed processes and objects as Web Services. UiPath cannot currently do this. 6. You cannot get BluePrism, not even trial version as they BluePrism is oly available to partner companies. So you cannot learn BluePrism unless your company is partner with BluePrism company. 7. Training cost of BluePrism is high compared with UiPath, Uipath itself provides the tutorials for learning. 8. Plus! You don't need to have programming knowledge to learn RPA, it is all activity based! 11. UiPath has a strong active community forum to answer your specific tech questions relating to software but blue prism doesn’t have their own forum at this point of time. 15. Blue Prism version 6 has advanced its spying capabilities but UiPath approach seems to be more intuitive on a given problematic applications or platforms. 17. Image recognition and OCR in UiPath is much better then Blue Prism. However blue prism 6 has started to bring in computer vision technology to strengthen surface automation programs. 18. Speed of implementation and development in UiPath is 2X then compared to Blue Prism due to lack of recording capabilities in Blue Prism. 19. Blue Prism per bot license is expensive compared to UiPath per bot license. 20 Blue prism can handle up to many robots per server vs UiPath can scale up to 10,000 robots per server. Blue Prism doesn’t mention any number. 21. The UiPath uses web based orchestrator to manage the bots while in Blue Prism the studio and the control are bundled within the same client software. 23. If there is a situation where you need multiple versions to co-exist then UiPath orchestrator can handle such situations unlike blue prism controller. 25. BluePrism and UiPath can be used to interchangeably, if you master one tool, you can easily switch to the other tool as well. Selenium is used only for Web-based testing i.e. testing of web application whereas RPA can be used for both Web as well as desktop based application. Writing test cases in selenium is comparatively time consuming but in RPA, you can design the workflow within minutes. Using Selenium requires core programming knowledge whereas in some RPA tools like UiPath, you don’t need to have programming knowledge. Selenium does not provide built in report functionality but RPA does. You don't need to have programming knowledge to learn UiPath, it is all drag and drop based. 3. After couple of minutes you will receive a email with download link. 5. Click on the advanced button and enable all the features. 6. Clicking next button will land you on activation wizard. 9. The main reason why we need UiPath is to automate application like desktop, pdf, website so on. For handling different process we need to install packages. 10. The pre-installed modules are available under the App Integration and if you want to install more packages, click on the packages icon(arrow pointed). 12. If you install any package the installed module will be placed under App Integration or System. 13. Please note that if you are in an organization, you may see blank screen on the available packages to install as your organization may not allow them. 14. We have to use proxy incase if you are not able to see any packages. 16. 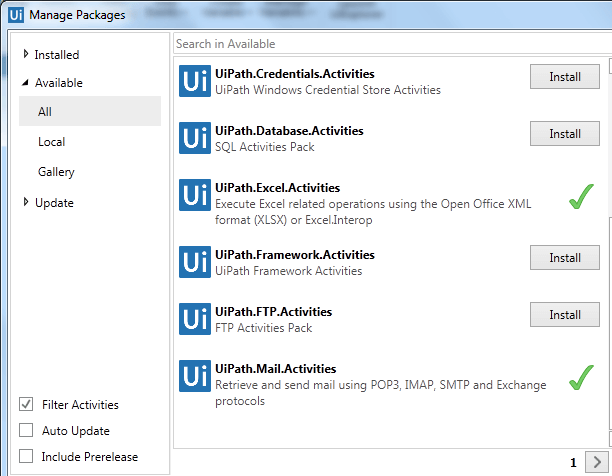 On the nuget url you can see all the modules and download to the modules to a folder in your local system. 17. Now on UiPath, click the packages icon and right click on the All > Configure Sources and point the directory to the local folder where you have downloaded all the packages. 18. 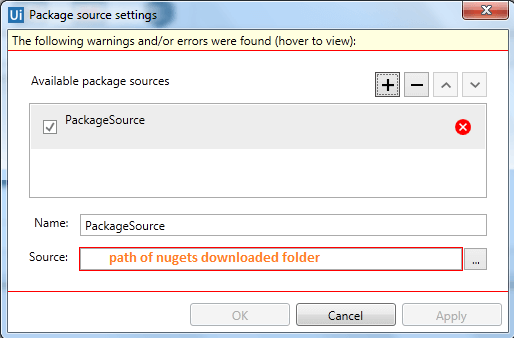 Click on the + icon and add the set the source as the nugets folder. 19. Sometimes while installing the UiPath may throw an error about dependency if the installing module has any dependency on another module, so we have to install that dependency first. 21. 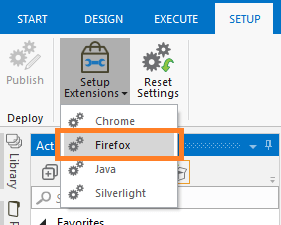 Navigate to Set Up tab on UiPath and click the Setup Extension, and choose the browser you want to integrate. 22. Above step may open, browser Extension page and you need to click add to browser(chrome/firefox), like normal extensions.